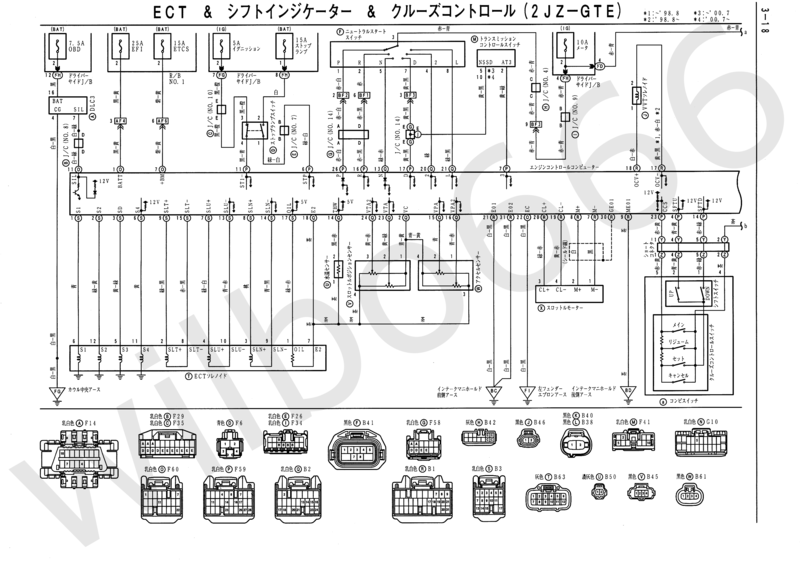 This page provides information in regards to 2JZ-GTE VVTi engine wiring as found in the Japanese JZS161 Toyota Aristo. 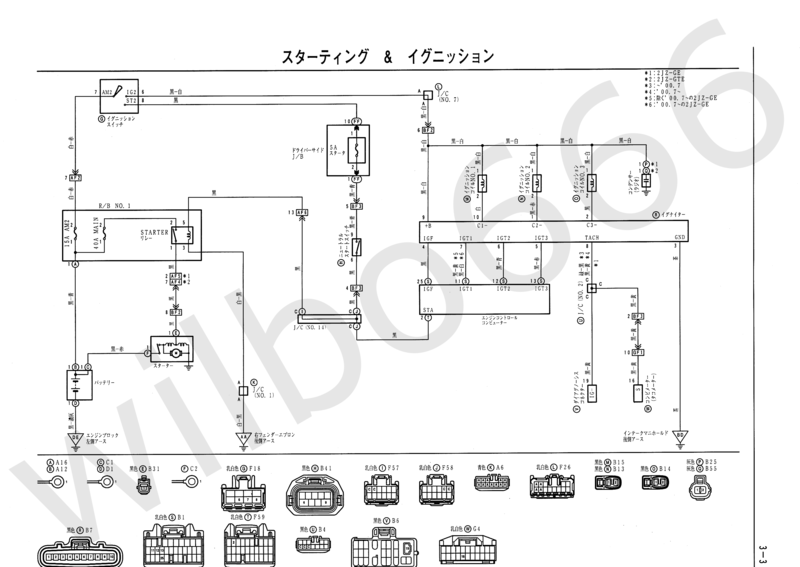 Note that the later revision engine ECU has an engine immobilizer inbuilt to the engine ECU. B1 1 #30 No. 3 Injector Output This pin is used to control the No.3 fuel injector. The fuel injectors are electronically controlled by the engine ECU. This pin is connected to Ground inside the ECU as required to turn the fuel injector ON. The fuel injector should be wired with one side of the solenoid connected to battery voltage (Ignition switched) and one side of the fuel injector connected to this ECU pin. B1 2 #40 Cyl 4 Injector Driver Output This pin is used to control the No.4 fuel injector. The fuel injectors are electronically controlled by the engine ECU. This pin is connected to Ground inside the ECU as required to turn the fuel injector ON. The fuel injector should be wired with one side of the solenoid connected to battery voltage (Ignition switched) and one side of the fuel injector connected to this ECU pin. B1 3 #50 Cyl 5 Injector Driver Output This pin is used to control the No.5 fuel injector. 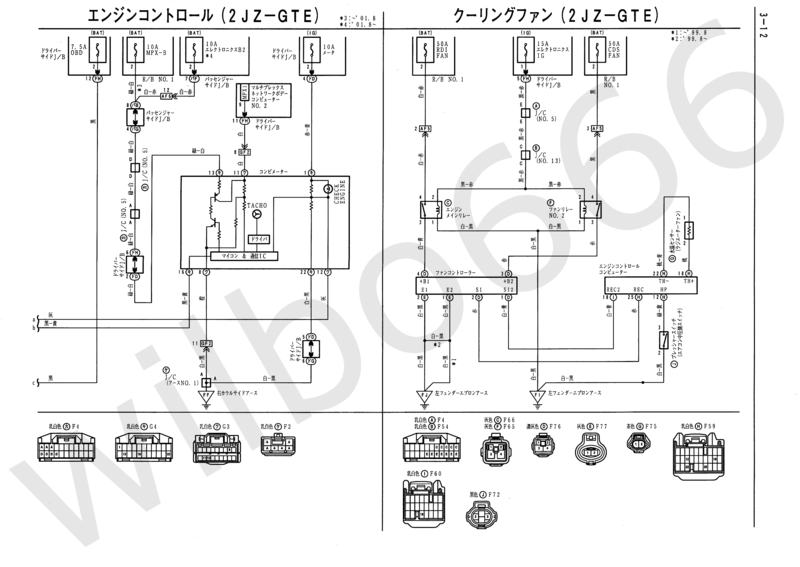 The fuel injectors are electronically controlled by the engine ECU. This pin is connected to Ground inside the ECU as required to turn the fuel injector ON. The fuel injector should be wired with one side of the solenoid connected to battery voltage (Ignition switched) and one side of the fuel injector connected to this ECU pin. B1 4 #60 Cyl 6 Injector Driver Output This pin is used to control the No.6 fuel injector. The fuel injectors are electronically controlled by the engine ECU. This pin is connected to Ground inside the ECU as required to turn the fuel injector ON. The fuel injector should be wired with one side of the solenoid connected to battery voltage (Ignition switched) and one side of the fuel injector connected to this ECU pin. B1 5 VSV1 Intake Air Bypass Valve Vacuum Switching Valve Output This pin is used to control the VSV which is used to open / close the Intake Air Bypass Valve that is a component of the sequential turbo system. The Intake Air Control Valve allows pressurised air to exit the rear turbocharger allowing it to fully come online as part of the sequential turbo system. This pin is connected to Ground inside the ECU as required to turn the Intake Air Control Valve VSV ON allowing pressurised intake air to open the Intake Air Control Valve. One side of the VSV should be wired to this pin and one side of VSV should be wired to battery voltage (Main EFI Relay switched). B1 6 MOL Main Oil Level Switch Input This pin is used to detect low engine oil level. This sensor is used for low oil level indication for the dash with the data being sent via the Multiplex network to the dash. 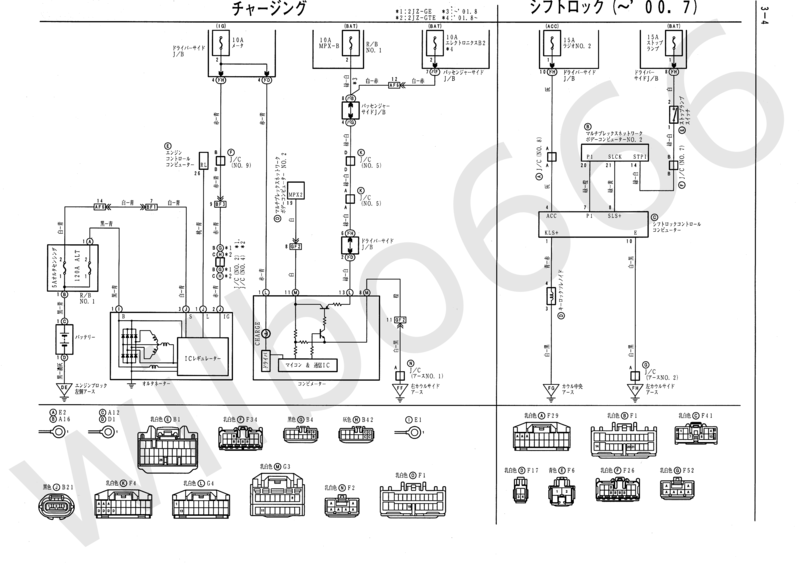 It is unknown if this switch plays any part in the engine control algorithms. This pin connects to an oil level switch that is installed at the sump on the front, lower, intake side of the engine to detect low engine oil level. One side of the oil level switch should be wired to this pin and one side of oil level switch should be wired to ground (common ground located at the intake manifold). B1 7 M- ETCS-i Motor Output This pin is used to control the electronic throttle control motor. The throttle is controlled by an electric motor that is controlled by the engine ECU. Having the throttle controlled by the engine ECU allows idle speed control, traction control, cruise control, etc to be built directly into the engine ECU simplifying the system. This pin is used together with the M+ pin to power the electric motor to allow it to be opened and closed by the engine ECU as required. The ETCS-i clutch must be engaged for the electric motor to be able to open or close the throttle. The M+ and M- pins are triggered by the engine ECU in a PWM fashion. B1 8 M+ ETCS-i Motor Output This pin is used to control the electronic throttle control motor. The throttle is controlled by an electric motor that is controlled by the engine ECU. Having the throttle controlled by the engine ECU allows idle speed control, traction control, cruise control, etc to be built directly into the engine ECU simplifying the system. This pin is used together with the M- pin to power the electric motor to allow it to be opened and closed by the engine ECU as required. The ETCS-i clutch must be engaged for the electric motor to be able to open or close the throttle. The M+ and M- pins are triggered by the engine ECU in a PWM fashion. B1 9 ME01 ETCS-i Ground Input Ground Used to supply a Ground path to allow current to flow. A separate ground is used for the electronic throttle control system to reduce noise introduced between systems. This pin connects to Ground or the battery negative. B1 10 G2 Intake Camshaft Position Sensor Input This pin is used to detect the location of the intake camshaft. The engine ECU needs to know the position of the intake camshaft for variable intake camshaft position control, the camshaft position sensor provides this information. This pin connects to the camshaft position sensor located to the rear of the intake side of the engine head which outputs 3 pulse (reluctor pulses) per camshaft revolution. B1 11 IGT Ignition Trigger Cyl 1 & Cyl 6 Output This pin is used to control the ignition for cylinders 1 & 6. The ignition timing is electronically controlled by the engine ECU. This pin is connected to +5V inside the engine ECU as required to trigger engine ignition. Ignition is triggered on the high (+5V) to low (0V) transition. B1 12 IGT2 Ignition Trigger Cyl 5 & Cyl 2 Output This pin is used to control the ignition for cylinders 5 & 2. The ignition timing is electronically controlled by the engine ECU. This pin is connected to +5V inside the engine ECU as required to trigger engine ignition. Ignition is triggered on the high (+5V) to low (0V) transition. B1 13 IGT3 Ignition Trigger Cyl 3 & Cyl 4 Output This pin is used to control the ignition for cylinders 3 & 4. The ignition timing is electronically controlled by the engine ECU. This pin is connected to +5V inside the engine ECU as required to trigger engine ignition. Ignition is triggered on the high (+5V) to low (0V) transition. B1 15 PMC Pressure Modulation Control (Wastegate) Vacuum Switching Valve Output This pin is used to control the VSV which controls the turbo wastegate on the front turbo. This VSV allows the engine ECU to attempt to control boost pressure. The Wastegate Control Valve allows exhaust gas to pre-spool the rear turbocharger prior to it coming online as part of the sequential turbo system. This pin is connected to Ground inside the ECU as required to turn the Pressure Modulation Control valve which is more commonly called the wastegate control valve ON allowing pressurised intake air to be diverted away from the mechanical wastegate actuator. When this VSV is ON the mechanical wastegate actuator will not operate and the wastegate will not open, this will result in a very large amount of boost pressure being generated by the turbochargers. One side of the VSV should be wired to this pin and one side of VSV should be wired to battery voltage (Main EFI Relay switched). B1 17 OCV- VVTi Solenoid Output This pin is used to control the solenoid that controls position of the intake camshaft. Controlling the position of the intake camshaft can be used to improve performance and fuel economy. This pin is used together with the OCV+ pin to power a solenoid that allows engine oil pressure to be used to vary the position of the intake camshaft. The OCV+ and OCV- pins are triggered by the engine ECU in a PWM fashion. B1 18 OCV+ VVTi Solenoid Output This pin is used to control the solenoid that controls position of the intake camshaft. Controlling the position of the intake camshaft can be used to improve performance and fuel economy. This pin is used together with the OCV- pin to power a solenoid that allows engine oil pressure to be used to vary the position of the intake camshaft. The OCV+ and OCV- pins are triggered by the engine ECU in a PWM fashion. B1 19 CL- ETCS-i Clutch Output This pin is used to control the electronic throttle control clutch. The throttle is controlled by an electric motor that is controlled by the engine ECU however there is a clutch that is controlled by the engine ECU that must be engaged for the electric motor to be able to move the throttle. If the engine ECU detects an issue with the ETCS-i system it will disable the clutch as a safety feature. This pin is used together with the CL+ pin to power the clutch that allows the electric motor to open and close engine throttle. The ETCS-i clutch must be engaged for the electric motor to be able to open or close the throttle. B1 20 CL+ ETCS-i Clutch Output This pin is used to control the electronic throttle control clutch. The throttle is controlled by an electric motor that is controlled by the engine ECU however there is a clutch that is controlled by the engine ECU that must be engaged for the electric motor to be able to move the throttle. If the engine ECU detects an issue with the ETCS-i system it will disable the clutch as a safety feature. This pin is used together with the CL- pin to power the clutch that allows the electric motor to open and close engine throttle. The ETCS-i clutch must be engaged for the electric motor to be able to open or close the throttle. B1 21 EO1 ECU Ground Input Ground Used to supply a Ground path to allow current to flow. This pin connects to Ground or the battery negative. B1 22 NE- Crankshaft & Intake Camshaft Position Sensor Ground Input This pin is used to provide a Ground to detect the speed and location of the engine crankshaft and intake camshaft. The engine ECU needs to know the position of the engine so that it can accurately provide fuel and ignition. This pin connects to the engine crankshaft position sensor and the intake camshaft position sensor. B1 23 NE+ Crankshaft Position Sensor Input This pin is used to detect the speed and location of the engine crankshaft. The engine ECU needs to know the position of the engine so that it can accurately provide fuel and ignition. This pin connects to the engine crankshaft position sensor located to the lower front of the exhaust side of the engine near the alternator which outputs 36-2 pulses (reluctor pulses) per engine crankshaft revolution. B1 25 IGF Igniter Verification Signal Input This is pin is used to detect if ignition has taken place successfully. If no ignition is occurring and fuel injection continues the spark plugs can be fouled and backfires can occur in the exhaust, the igniter sends a signal to inform the engine so that it can stop fuel injection if successful ignition is not detected. This pin is connected to Ground by the Igniter for a short period of time after a successful ignition event has been detected. B1 26 RL Alternator Charge Light Output (L) Input This pin is used to detect the status of the alternator regulators charge light output. The alternator charge light output is used for indication of the alternator charging status for the dash with the data being sent via the Multiplex network to the dash. It is unknown if this input plays any part in the engine control algorithms. This pin connects to the alternator regulator charge status output and is grounded by the alternator regulator to indicate that the alternator is not charging. In normal operation this pin should be open circuit. B1 27 KNK2 No.2 Knock Sensor (Rear) Input This pin is used to measure engine knock. Engine knock can occur if too much ignition timing and poor fuel are present, as engine knock can damage an engine the engine ECU used a knock sensor to detect and compensate for knock if is detected. This pin connects to the signal output of the knock sensor which is mounted under the intake manifold, to the rear of the engine and screwed into the side of the engine block. The knock sensor is Grounded via the engine block. 8.1kHz is the normal mode vibration. B1 28 KNK1 No.1 Knock Sensor (Front) Input This pin is used to measure engine knock. Engine knock can occur if too much ignition timing and poor fuel are present, as engine knock can damage an engine the engine ECU used a knock sensor to detect and compensate for knock if is detected. This pin connects to the signal output of the knock sensor which is mounted under the intake manifold, to the front of the engine and screwed into the side of the engine block. The knock sensor is Grounded via the engine block. 8.1kHz is the normal mode vibration. B1 29 LCKI Airconditioning Compressor Lock Sensor Input This pin is used to detect the speed of the airconditioning compressor. This speed sensor can be used to detect if the airconditioning compressor seizes or becomes disconnected, in which case the engine ECU will disable the airconditioning compressor to avoid further damage. This pin connects to the airconditioning compressor speed sensor located at the bottom of the airconditioning compressor. The other side of the airconditioning compressor speed sensor should be connected to ground. B1 30 GEO1 ETCS-i Motor Shielding Output This pin is used to shield the wires used to control the electronic throttle control electric motor. Operation of the electronic throttle control electric motor can generate a significant amount of electrical noise, shielding of the wires has been used to reduce the amount of electrical noise that is transmitted into other systems. This pin is connected to ground inside the engine ECU and connects to the shield that covers the wires (M+ and M-) that are used to control the electronic throttle control electric motor. B1 31 EO2 ECU Ground Input Ground Used to supply a Ground path to allow current to flow. This pin connects to Ground or the battery negative. B2 2 VC Sensor Power Output This pin is used to supply +5V power to the throttle position and MAP sensors. The throttle position and MAP sensors require regulated and constant +5V to operate. This pin outputs regulated +5V to the throttle position sensors and the MAP sensor. B2 3 VSV2 Exhaust Gas Control Valve Vacuum Switching Valve Output This pin is used to control the VSV which is used to open / close the Exhaust Gas Control Valve that is a component of the sequential turbo system. The Exhaust Gas Control Valve allows exhaust gas to exit the rear turbocharger allowing it to fully come online as part of the sequential turbo system. This pin is connected to Ground inside the ECU as required to turn the Exhaust Gas Control Valve VSV ON allowing pressurised intake air to open the Exhaust Gas Control Valve. One side of the VSV should be wired to this pin and one side of VSV should be wired to battery voltage (Main EFI Relay switched). B2 4 HT Oxygen Sensor Heater Output This pin is used to control the heater for the exhaust gas oxygen sensor. The oxygen sensor requires a certain temperature to start operating, to allow this temperature to be reached quickly and allow the oxygen sensor to start operation the sensor is heated. This pin connects to Ground inside the engine ECU as required to turn the oxygen sensor heater on. One side of the oxygen sensor heater should be wired to this pin and one side of oxygen sensor heater should be wired to battery voltage (Main EFI Relay switched). B2 5 #10 Cyl 1 Injector Driver Output This pin is used to control the No.1 fuel injector. The fuel injectors are electronically controlled by the engine ECU. This pin is connected to Ground inside the ECU as required to turn the fuel injector ON. The fuel injector should be wired with one side of the solenoid connected to battery voltage (Ignition switched) and one side of the fuel injector connected to this ECU pin. B2 6 #20 Cyl 2 Injector Driver Output This pin is used to control the No.2 fuel injector. The fuel injectors are electronically controlled by the engine ECU. This pin is connected to Ground inside the ECU as required to turn the fuel injector ON. The fuel injector should be wired with one side of the solenoid connected to battery voltage (Ignition switched) and one side of the fuel injector connected to this ECU pin. B2 7 PRG Evaporative Emission Control Vacuum Switching Valve Output This pin is used to control the VSV which is used to allow fuel vapour from the charcoal canister to enter the intake manifold and enter the engine. Fuel vapours from the fuel tank are captured in the charcoal canister to protect the environment, the PRG VSV is used to allow these captured emissions to be burnt during normal engine operation as determined by the engine ECU. This pin is connected to Ground inside the ECU as required to turn the Evaporative Emissions Control Valve VSV ON allowing fuel emissions to pass to the intake manifold into the engine. One side of the VSV should be wired to this pin and one side of VSV should be wired to battery voltage (Main EFI Relay switched). B2 8 MOPS Main Oil Pressure Switch Input This pin is used to sense low engine oil pressure. This sensor is the low oil pressure switch for the dash with the data being sent via the Multiplex network to the dash. It is unknown if this switch plays any part in the engine control algorithms. This pin connects to a pressure switch that is installed at the oil filter assembly on the lower, intake side of the engine to measure engine oil pressure. The oil pressure switch is grounded via the engine block. B2 9 PIM Pressure Intake Manifold (MAP Sensor) Input This pin is used to determine the manifold air pressure (MAP). Manifold air pressure is used for control of the sequential turbo system as well as boost cut. This pin connects to the signal output of the MAP sensor which contains a small sensor to measure air pressure. A small vacuum hose connects the MAP sensor to the intake after the throttle body. B2 10 VG Engine Airflow Input This pin is used to determine the engine airflow. Engine airflow is a primary component in the fuel injection control algorithm. If the engine airflow is known then the amount of fuel required to achieve a desired air fuel ratio can be calculated by the engine ECU. This pin connects to the signal output of the airflow sensor. The airflow sensor is located in the engine intake piping just after the airfilter. B2 12 OX Oxygen Sensor Input This pin is used to determine the exhaust gas air fuel ratio. The engine ECU will aim for an air fuel ratio near stoichiometric (neither rich or lean) to enhance fuel economy under periods of low load. This pin connects to the signal output of the oxygen sensor that is mounted in the exhaust. The factory oxygen sensor is a 'narrow band' oxygen sensor that outputs approximately 0V when the air fuel ratio is lean and approximately 1V when the air fuel ratio is rich. The engine ECU will aim to keep the engine running at stoichiometric by alternating between very slightly rich and very slightly lean conditions, as the sensor is only a narrow band sensor this is a practical way to achieve (or very close to) the desired stoichiometric air fuel ratio. B2 13 N Automatic Transmission Neutral Gear Position Indicator Input This pin is used to determine if the automatic transmission shifter is in the Neutral position. This signal is also sent via the Multiplex network to the dash for display. The engine ECU needs to energise/de-energise the automatic transmission solenoids to select the correct gear. This pin is connected to battery voltage by the automatic shifter position switch when the automatic transmission shifter is in the 'N' position. B2 14 THW Water Temperature Sensor Input This pin is used to measure the temperature of the engine coolant exiting the engine. The engine coolant temperature has a significant effect on the engines operation, for example requiring more fuel during 'warm up' conditions. This sensor is also the water temperature sensor for the dash with the data being sent via the Multiplex network to the dash. This pin connects to a thermistor that is installed at the engine coolant water outlet to the radiator on the front, upper, exhaust side of the engine to measure engine coolant temperature. One side of the thermistor should be wired to this pin and one side of the thermistor should be wired to the engine ECU pin E2 (Ground). B2 15 VPA Throttle Position Sensor (Demand Position Sensor) Input This pin is used to effectively detect the position of the accelerator pedal which reflects the operators desired throttle position. The operators desired throttle position is a useful parameter for engine operation, particularly in transient conditions such as acceleration. This pin measures the variable voltage from one of the outputs from the position sensor that measures how depressed the accelerator pedal is. The position sensor has two outputs (VPA and VPA2) with different responses that allow the engine ECU to perform diagnostics during normal operation. B2 16 VPA2 Throttle Position Sensor (Demand Position Sensor) Input This pin is used to effectively detect the position of the accelerator pedal which reflects the operators desired throttle position. The operators desired throttle position is a useful parameter for engine operation, particularly in transient conditions such as acceleration. This pin measures the variable voltage from one of the outputs from the position sensor that measures how depressed the accelerator pedal is. The position sensor has two outputs (VPA and VPA2) with different responses that allow the engine ECU to perform diagnostics during normal operation. 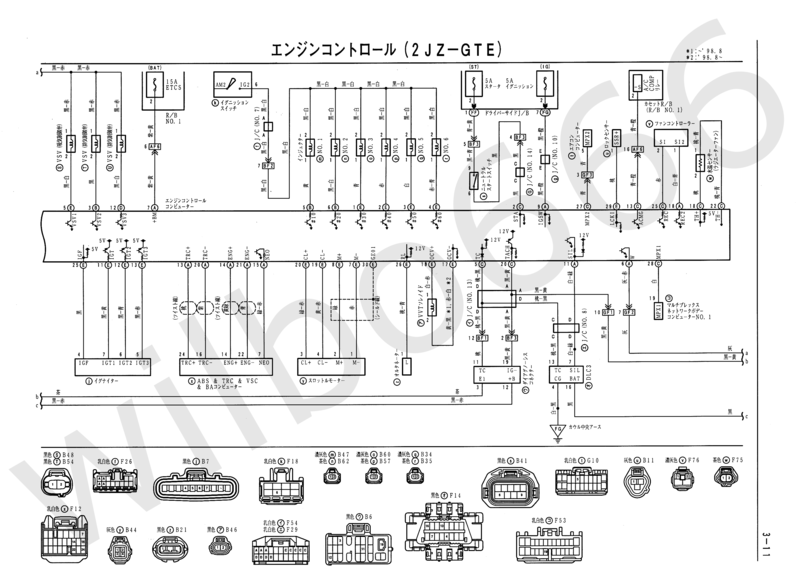 B2 17 E1 ECU Ground Input Ground. Used to supply a Ground path to allow current to flow. This pin connects to Ground or the battery negative. B2 18 E2 Sensor Ground Output Sensor ground. The throttle position, airflow, air and water temperature and MAP sensors have a separate ground to ensure clear signals. This pin is connected to sensor Ground inside the engine ECU. Do not connect this pin to chassis Ground. B2 19 EVG Airflow Meter Ground Input Airflow meter signal ground. The airflow meter sensor has a separate signal ground to ensure a clear signal. This pin is connected to sensor Ground inside the engine ECU. Do not connect this pin to chassis Ground. B2 20 2 Automatic Transmission 2nd Gear Position Indicator Input This pin is used to determine if the automatic transmission shifter is in the 2nd position. This signal is also sent via the Multiplex network to the dash for display. The engine ECU needs to energise/de-energise the automatic transmission solenoids to select the correct gear. This pin is connected to battery voltage by the automatic shifter position switch when the automatic transmission shifter is in the '2' position. B2 21 L Automatic Transmission 1st Gear Position Indicator Input This pin is used to determine if the automatic transmission shifter is in the L position. This signal is also sent via the Multiplex network to the dash for display. The engine ECU needs to energise/de-energise the automatic transmission solenoids to select the correct gear. This pin is connected to battery voltage by the automatic shifter position switch when the automatic transmission shifter is in the 'L' position. B2 22 THA Air Temperature Sensor Input This pin is used to measure the temperature of the engine inlet manifold air. The engine air temperature has an effect on the engines operation, such as reducing ignition timing if the intake air is very hot. This pin connects to a thermistor that is installed at the middle, engine side of the engine intake manifold to the radiator on the front, upper, exhaust side of the engine to measure engine air intake temperature. One side of the thermistor should be wired to this pin and one side of the thermistor should be wired to the engine ECU pin E2 (Ground). B2 23 VTA Throttle Position Sensor (Actual Throttle Position Sensor) Input This pin is used to detect the actual position of the throttle. The actual throttle position allows the engine ECU to set the throttle to a know position based on the desired throttle position and the engine ECUs desired programming. This pin measures the variable voltage from one of the outputs from the position sensor that measures the actual throttle position. The position sensor has two outputs (VTA and VTA2) with different responses that allow the engine ECU to perform diagnostics during normal operation. B2 24 VTA2 Throttle Position Sensor (Actual Throttle Position Sensor) Input This pin is used to detect the actual position of the throttle. The actual throttle position allows the engine ECU to set the throttle to a know position based on the desired throttle position and the engine ECUs desired programming. This pin measures the variable voltage from one of the outputs from the position sensor that measures the actual throttle position. The position sensor has two outputs (VTA and VTA2) with different responses that allow the engine ECU to perform diagnostics during normal operation. B3 1 S1 Automatic Transmission No.1 Shift Solenoid Output This pin is used to control the automatic transmission No.1 shift solenoid. The automatic transmission gear selection is controlled by electronic solenoids. This pin outputs battery voltage to turn the No.1 shift solenoid ON as required. The No.1 shift solenoid is ON in gears 1 & 2. The other side of the No.1 shift solenoid is Grounded inside the automatic transmission. B3 2 S2 Automatic Transmission No.2 Shift Solenoid Output This pin is used to control the automatic transmission No.2 shift solenoid. The automatic transmission gear selection is controlled by electronic solenoids. This pin outputs battery voltage to turn the No.2 shift solenoid ON as required . The No.2 shift solenoid is ON in gears 2 & 3. The other side of the No.2 shift solenoid is Grounded inside the automatic transmission. B3 3 SD Automatic Transmission Shift Solenoid Output ? ? ? B3 4 NCO+ Automatic Transmission Over Drive Direct Clutch Speed Sensor Input This pin is used to detect the speed of the automatic transmission O/D input shaft. Detection of the automatic transmission OD input shaft speed can be used to improve shift timing and ensure smooth gear shifts. This pin connects to the OD speed sensor located on the left, front side of the automatic transmission and outputs a number of pulses (reluctor pulses) per revolution of the OD direct clutch drum. B3 5 SP2+ Speed Sensor Input This pin is used to determine vehicle speed. Vehicle speed is used in idle control, automatic transmission shift control, cruise control, speed limiting etc. This sensor also provides the speed signal for the dash with the data being sent via the Multiplex network to the dash. This pin connects to the speed sensor located on the left, rear side of the automatic transmission and outputs 12 pulses (reluctor pulses) per revolution of the automatic transmission output shaft. B3 6 S4 Automatic Transmission Shift Solenoid Output ? ? ? B3 7 SLU+ Automatic Transmission Lock Up Solenoid Output This pin is used to control the automatic transmission lock up torque converter control solenoid which is used to enable torque converter lock up. The automatic transmission lock up torque converter is controlled by an electronic solenoid. This pin in association with the SLU- pin outputs battery voltage to turn the lock up torque converter solenoid ON. B3 8 SLN+ Automatic Transmission Accumulator Back Pressure Solenoid Output This pin is used to control the automatic transmission accumulator back pressure control solenoid. The automatic transmission accumulator back pressure is controlled by an electronic solenoid. This pin in association with the SLN- pin outputs Pulse Width Modulated (PWM) battery voltage to turn the accumulator back pressure control solenoid ON. B3 9 SLT+ Automatic Transmission Line Pressure Control Solenoid Output This pin is used to control the automatic transmission line pressure control solenoid. The automatic transmission line pressure is controlled by an electronic solenoid. This pin in association with the SLT- pin outputs Pulse Width Modulated (PWM) battery voltage to turn the line pressure control solenoid ON. B3 10 NCO- Automatic Transmission Over Drive Direct Clutch Speed Sensor Input This pin is used to detect the speed of the automatic transmission O/D input shaft. Detection of the automatic transmission OD input shaft speed can be used to improve shift timing and ensure smooth gear shifts. This pin connects to the OD speed sensor located on the left, front side of the automatic transmission and outputs a number of pulses (reluctor pulses) per revolution of the OD direct clutch drum. B3 11 SP2- Speed Sensor Input This pin is used to determine vehicle speed. Vehicle speed is used in idle control, automatic transmission shift control, cruise control, speed limiting etc. This sensor also provides the speed signal for the dash with the data being sent via the Multiplex network to the dash. This pin connects to the speed sensor located on the left, rear side of the automatic transmission and outputs 12 pulses (reluctor pulses) per revolution of the automatic transmission output shaft. B3 12 VSV3 Exhaust Bypass Valve Vacuum Switching Valve Output This pin is used to control the VSV which is used to open / close the Exhaust Bypass Valve that is a component of the sequential turbo system. The Exhaust Bypass Valve allows exhaust gas to pre-spool the rear turbocharger prior to it coming online as part of the sequential turbo system. This pin is connected to Ground inside the ECU as required to turn the Exhaust Bypass Valve VSV ON allowing pressurised intake air to open the Exhaust Bypass Valve. One side of the VSV should be wired to this pin and one side of VSV should be wired to battery voltage (Main EFI Relay switched). B3 13 SLU- Automatic Transmission Lock Up Solenoid Output This pin is used to control the automatic transmission lock up torque converter control solenoid which is used to enable torque converter lock up. The automatic transmission lock up torque converter is controlled by an electronic solenoid. This pin in association with the SLU+ pin outputs battery voltage to turn the lock up torque converter solenoid ON. B3 14 SLN- Automatic Transmission Accumulator Back Pressure Solenoid Output This pin is used to control the automatic transmission accumulator back pressure control solenoid. The automatic transmission accumulator back pressure is controlled by an electronic solenoid. This pin in association with the SLN+ pin outputs Pulse Width Modulated (PWM) battery voltage to turn the accumulator back pressure control solenoid ON. B3 15 SLT- Automatic Transmission Line Pressure Control Solenoid Output This pin is used to control the automatic transmission line pressure control solenoid. The automatic transmission line pressure is controlled by an electronic solenoid. This pin in association with the SLT+ pin outputs Pulse Width Modulated (PWM) battery voltage to turn the line pressure control solenoid ON. B3 16 FPU Fuel Pressure Up Vacuum Switching Valve Output This pin is used to control the VSV which is used to increase fuel pressure during hot soak starting. To reduce the possibility of fuel vapour formation in the fuel rail during starting from hot soak conditions the Fuel Pressure Up VSV is used to increase the fuel rail pressure for a short period of time after hot soak starting. This pin is connected to Ground inside the ECU as required to turn the Fuel Pressure Up VSV ON which vents the fuel pressure regulator reference to atmosphere resulting in increased fuel rail pressure. One side of the VSV should be wired to this pin and one side of VSV should be wired to battery voltage (Main EFI Relay switched). B3 17 OIL Automatic Transmission Oil Temperature Sensor Input This pin is used to measure the automatic transmission oil temperature. The automatic transmission oil temperature has a significant effect on the automatic transmissions operation, the engine ECU can compensate if the automatic transmission oil temperature is measured. This pin connects to a thermistor that is installed inside the automatic transmission to measure the automatic transmission oil temperature. One side of the thermistor should be wired to this pin and one side of the thermistor should be wired to the engine ECU pin E2 (Ground). F59 2 STA Starter Signal Input This pin is used to determine if the engine is being cranked. The engine ECU can take action to allow the engine to start easier if it is aware that the engine is trying to be started. This pin is connected to battery voltage when the ignition switch is in CRANK position. F59 3 FCUT Fuel Cut Output? This pin is used to monitor the FPC fuel pump control signal? It is believed that this pin is used as a safety check to confirm that the FPC signal and the engine ECU is functioning correctly. It is believed that if abnormal pulses or voltage are detected on this pin that fuel pump and engine operation will be stopped? This pin is connected to the FPC pin. Note: 2000-07 onwards models only, earlier models do not have this pin wired. F59 4 SFTU Automatic Transmission Shift Up Input This pin is used to detect the drivers request to shift the automatic transmission up a gear from the steering wheel controls. Driver control of the automatic transmission. This pin is connected to ground when the switch to shift the automatic transmission up a gear is activated, the ECU pin is open circuit when the switch is not activated. F59 5 TC Test Connector Input This pin is used to select the test mode during which diagnostic codes are flashed on the check engine light. Used to help in diagnosing issues. This pin is connected to Ground to enable test mode. F59 6 STP Stop Light Switch Input This pin is used to detect when the brake pedal is depressed. Used to disable the automatic transmission lock up torque converter, exit deceleration fuel cut, cruise control etc. This pin is connected to battery voltage when the brake pedal is depressed, the ECU pin is open circuit when the brake pedal is not depressed. F59 7 3 Automatic Transmission 3rd Gear Position Indicator Input This pin is used to determine if the automatic transmission shifter is in the 3rd position. This signal is also sent via the Multiplex network to the dash for display. The engine ECU needs to energise/de-energise the automatic transmission solenoids to select the correct gear. This pin is connected to battery voltage by the automatic shifter position switch when the automatic transmission shifter is in the '3' position. F59 10 TAM Ambient Air Temperature Sensor Input This pin is used to measure the temperature of the ambient air. It is suspected that this sensor measures the temperature of the ambient air for the climate control, etc systems with the data being sent via the Multiplex network to the dash. It is unknown if this sensor plays any part in the engine control algorithms. This pin connects to a thermistor that is installed at the far front of the car. One side of the thermistor should be wired to this pin and one side of the thermistor should be wired to the engine ECU pin E2 (Ground). F59 11 ST1- Brake Signal Switch Input This pin is used to detect when the brake pedal is depressed. It is suspected that this pin is primarily responsible for exiting cruise control. As the engine ECU is used for cruise control a failsafe detection method of brake pedal state via a dual contact brake switch is used. 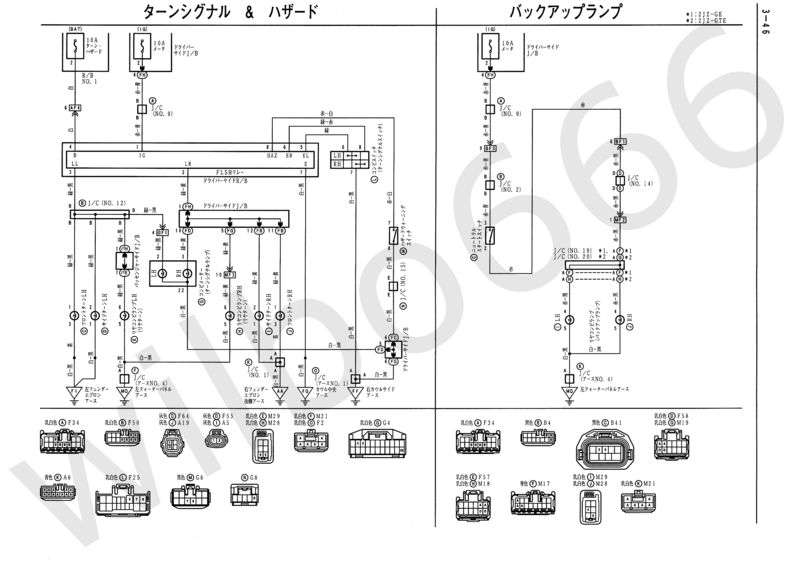 It is unknown if this switch plays any other part in the engine control algorithms. This pin is disconnected from battery voltage when brake pedal is depressed, the ECU pin is connected to battery voltage when the brake pedal is not depressed. F59 12 PRE2 Airconditioning Pressure Switch 2 Input This pin is used to detect when the airconditioning system pressure is too high?/too low?/other? 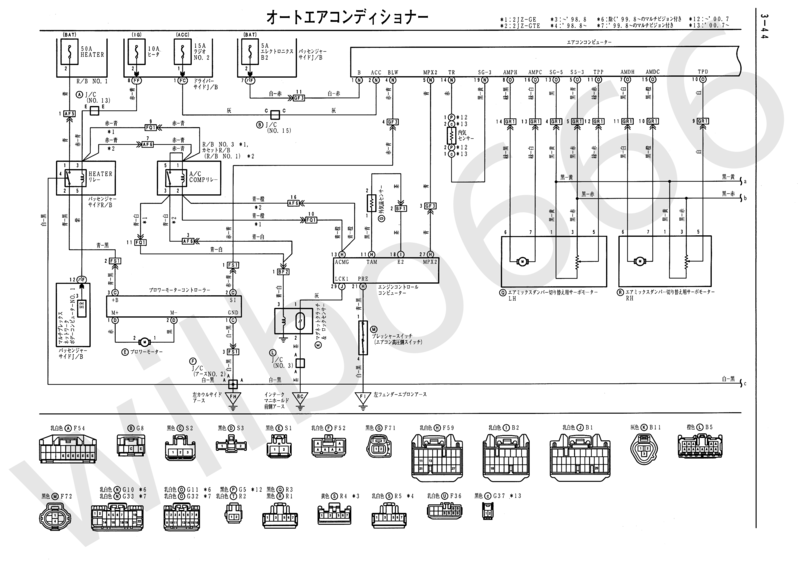 As final control of the airconditioning compressor is determined by the engine ECU it is logical to have the system healthy switches (airconditioning compressor speed, system pressures, etc) go to the engine ECU to ensure that the airconditioning system is controlled correctly. This pin is connected to ground when the switch is activated, the ECU pin is open circuit when the switch is not activated. It is suspected that when this switch is activated the airconditioning compressor will not be able to be engaged. F59 13 ACMG Airconditioning Magnetic Clutch Relay Trigger Output This pin is used to turn the airconditioning magnetic clutch relay ON. ECU control of the airconditiong enables the airconditioning to be turned off during hard acceleration, etc. This pin is Grounded by the ECU as required to turn the airconditioning magnetic clutch relay ON. One side of the airconditioning magnetic clutch relay coil should be wired to this pin and one side of the airconditioning magnetic clutch relay coil should be connected to battery voltage (Ignition switched) and one side of the relay coil connected to this ECU pin. F59 14 SFTD Automatic Transmission Shift Down Input This pin is used to detect the drivers request to shift the automatic transmission down a gear from the steering wheel controls. Driver control of the automatic transmission. This pin is connected to ground when the switch to shift the automatic transmission down a gear is activated, the ECU pin is open circuit when the switch is not activated. F59 16 R Automatic Transmission Reverse Gear Position Indicator Input This pin is used to determine if the automatic transmission shifter is in the reverse position. This signal is also sent via the Multiplex network to the dash for display. The engine ECU needs to energise/de-energise the automatic transmission solenoids to select the correct gear. This pin is connected to battery voltage by the automatic shifter position switch when the automatic transmission shifter is in the 'R' position. F59 17 D Automatic Transmission Drive Gear Position Indicator Input This pin is used to determine if the automatic transmission shifter is in the drive position. This signal is also sent via the Multiplex network to the dash for display. The engine ECU needs to energise/de-energise the automatic transmission solenoids to select the correct gear. This pin is connected to battery voltage by the automatic shifter position switch when the automatic transmission shifter is in the 'D' position. F59 18 TH+ Engine Coolant Temperature Sensor Input This pin is used to measure the temperature of the engine coolant in the lower tank of the radiator. The temperature of the engine coolant in the lower tank of the engine radiator is used to control the speed of the hydraulic engine cooling fan. As the temperature of the coolant increases the speed of the hydraulic engine cooling fan increases. This pin connects to a thermistor that is installed in the lower tank of the engine radiator. One side of the thermistor should be wired to this pin and one side of the thermistor should be wired to the engine ECU pin TH-. F59 20 TACH Tachometer Output This pin is used to output a PWM signal that correlates to engine RPM. Engine RPM is displayed on the dash and also available at the diagnostic connector mounted on the side of the engine. This pin outputs a 0V to battery voltage Pulse Width Modulated (PWM) signal related to engine RPM. F59 21 PRE Airconditioning Pressure Switch Input This pin is used to detect when the airconditioning system pressure is too high or too low. 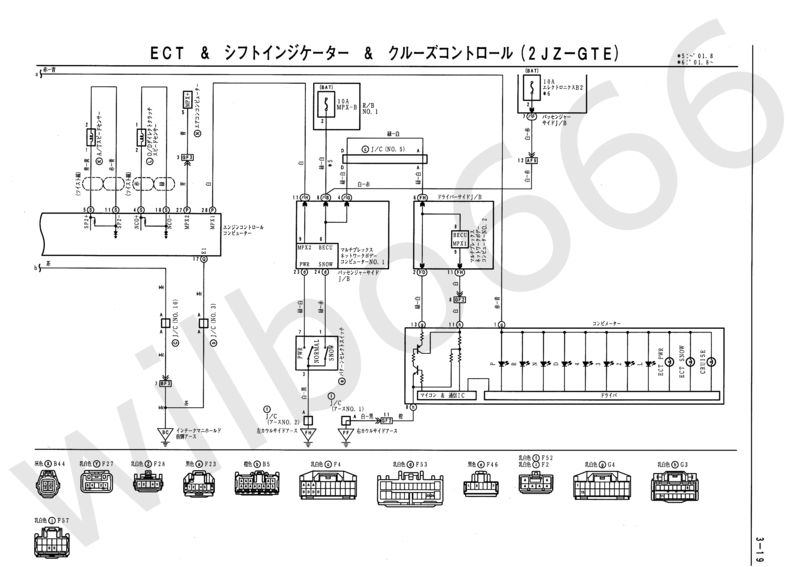 As final control of the airconditioning compressor is determined by the engine ECU it is logical to have the system healthy switches (airconditioning compressor speed, system pressures, etc) go to the engine ECU to ensure that the airconditioning system is controlled correctly. This pin is connected to ground when the system pressure is healthy, the ECU pin is open circuit when the system pressure is not healthy. It is suspected that when the system pressure is not healthy the airconditioning compressor will not be able to be engaged. F59 22 TH- Engine Coolant Temperature Sensor Input This pin is used to measure the temperature of the engine coolant in the lower tank of the radiator. The temperature of the engine coolant in the lower tank of the engine radiator is used to control the speed of the hydraulic engine cooling fan. As the temperature of the coolant increases the speed of the hydraulic engine cooling fan increases. This pin connects to a thermistor that is installed in the lower tank of the engine radiator. One side of the thermistor should be wired to this pin and one side of the thermistor should be wired to the engine ECU pin TH+. F59 23 CCS Cruise Control Switch Input This pin is used to detect the pressing of the cruise control switches (SET, RES, ON-OFF, CANCEL) The cruise control operation is built into the engine ECU and makes use of the electronically controlled throttle body to achieve this function. This pin is connected to battery voltage inside the engine ECU via a pull up resistor. The various cruise control switches are connected to ground via specific pull down resistors when the switches are activated to form a voltage divider. The resultant voltage generated by the voltage dividers is detected by the engine ECU to set the cruise control as required. F59 25 REC Hydraulic Fan Control Output This pin is used to control the speed of the hydraulic engine cooling fan. The speed of the hydraulic engine cooling fan is determined by the temperature of the engine coolant in the lower tank of the radiator. This pin is used together with the REC2 pin to power the solenoid that controls the flow of hydraulic fluid and hence the speed of the hydraulic engine cooling fan. The REC and REC2 pins are triggered by the engine ECU in a PWM fashion. F59 26 P Automatic Transmission Park Gear Position Indicator Input This pin is used to determine if the automatic transmission shifter is in the park position. This signal is also sent via the Multiplex network to the dash for display. The engine ECU needs to energise/de-energise the automatic transmission solenoids to select the correct gear. This pin is connected to battery voltage by the automatic shifter position switch when the automatic transmission shifter is in the 'P' position. F59 27 MPX2 Multiplex Communications to Airconditioning ECU Output This pin is used to transmit data between different vehicle modules. Much of the data that is collected by the engine ECU and other modules can and is used in other modules throughout the vehicle. E.g. the engine ECU sends the water temperature signal to the dash, the automatic transmission shifter position signals, etc via the Multiplex network. The Multiplex network transmits data via serial. F59 28 MPX1 Multiplex Communications to Multiplex Network Body Computer No.1 Input This pin is used to transmit data between different vehicle modules. 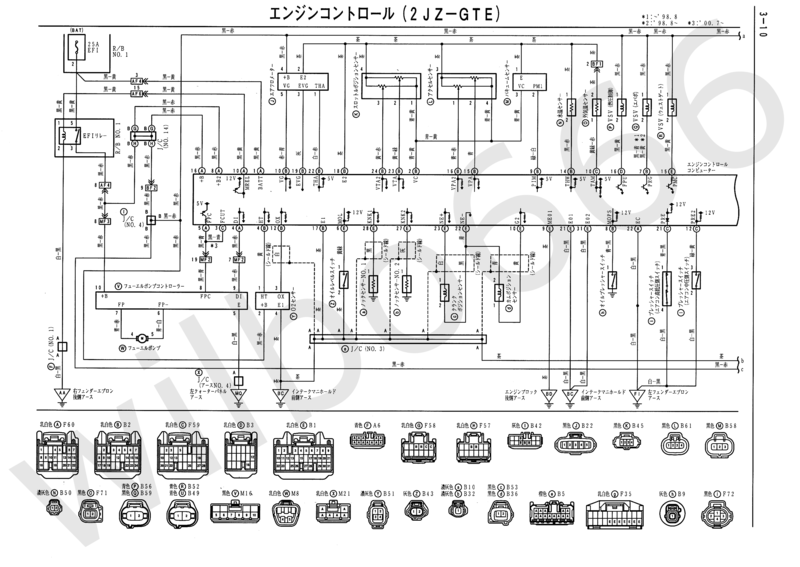 Much of the data that is collected by the engine ECU and other modules can and is used in other modules throughout the vehicle. E.g. the engine ECU sends the water temperature signal to the dash, the automatic transmission shifter position signals, etc via the Multiplex network. The Multiplex network transmits data via serial. F60 1 BATT Battery Power Input This pin is used to supply constant battery power to the ECU. Constant battery power allows the engine ECU to retain error codes, fuel trims, etc. This pin is connected to battery voltage at all times via the 25A EFI fuse. F60 4 DI Diagnostic Indication (Fuel Pump Control) Input This pin is used to determine if the Fuel Pump ECU is healthy. This pin lets the engine ECU know if the Fuel Pump ECU is healthy, if the Fuel Pump ECU is not healthy the engine ECU stops the output on the FPC pin. This pin is connected to battery voltage when the Fuel Pump ECU is healthy, the pin is open circuit when Fuel Pump ECU is not healthy. F60 5 FPC Fuel Pump Control Output This pin is used to signal the desired fuel pump speed to the Fuel Pump ECU. The fuel pump speed can be reduced at low load conditions to make the fuel quieter and improve fuel pump longevity. This pin outputs a 0V to 5V Pulse Width Modulated (PWM) signal which is connected to the Fuel Pump ECU to control fuel pump speed. F60 6 W Engine Warning Light (Check Engine Light) Output This pin is used to turn ON / OFF the check engine light. The check engine light comes on to inform of a detected engine issue. This pin is Grounded by the ECU as required to turn the Check Engine Light ON. The check engine light should be wired with one side of the light connected to battery voltage (Ignition Switched) and one side of the light connected to this ECU pin. Light ON = Error Condition, light OFF = Normal. F60 7 +BM ETCS-i Power Input This pin is used to supply constant battery power to the ECU for the electronic throttle control system. Used to supply power for the electronic throttle control system. This pin is connected to battery voltage at all times via the 15A ETCS fuse. F60 8 +B2 EFI Main Relay Switched Power Input This pin is used to supply switched battery power to the ECU. Used to supply power. This pin is connected to battery voltage when the Main EFI Relay is energised to supply power to the ECU. The Main EFI Relay is triggered by the engine ECU pin M-REL pin. F60 9 IGSW Ignition Switch Input This pin is used to determine if the ignition is ON. The engine ECU is turned on by this signal. This pin is connected to battery voltage when the ignition switch is in RUN and CRANK positions. F60 10 M-REL EFI Main Relay Trigger Output This pin is used to turn ON the Main EFI Relay which feeds power to the fuel pump, engine ECU, engine VSVs and O2 sensor heater circuits, etc. ECU control of the main power relay allows the ECU to remain powered up after engine shutdown. This pin is connected to battery voltage inside the ECU as required to turn the Main EFI Relay ON when the ignition switch is ON. Note that this pin continues to output voltage for a few second after the ignition has been switched off to allow the ISCV to be fully opened by the ECU for the next engine start. One side of the Main EFI Relay coil should be connected to this pin and one side of the Main EFI Relay coil should be connected to Ground. F60 11 SIL OBDII Output This pin is used to provide OBDII diagnostic information. Many engine parameters can be monitored via the OBDII interface, which maybe particularly helpful in diagnosing issues that maybe present in the engine control system. The ISO 9141-2 K-Line standard is used to provide OBDII information via serial. 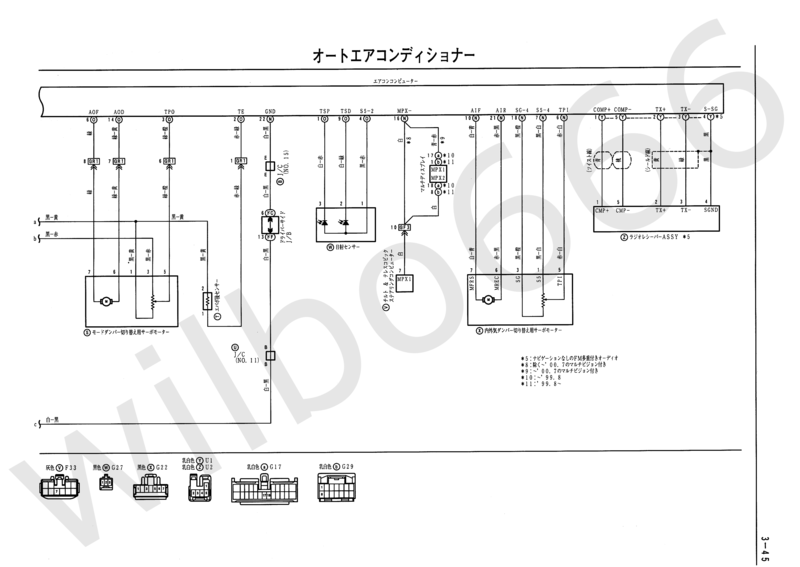 F60 13 TRC+ ABS & TRC & VSC ECU Serial Data Input It is believed that this pin is used to communicate data via serial from the ABS, TRC and VSC ECU to the engine ECU. It is believed that the ABS, TRC and VSC control systems can act to modify the engine control as required by requesting the engine ECU to reduce engine torque etc via closing the throttle, modifying engine ignition or fuelling. It is believed that this data connections allows this control to take place. Differential serial data is transmitted via the TRC+ and TRC- pins. F60 14 ENG+ ABS & TRC & VSC ECU Serial Data Output It is believed that this pin is used to communicate data via serial from the engine ECU to the ABS, TRC and VSC ECU. It is believed that the ABS, TRC and VSC control systems can act to modify the engine control as required by requesting the engine ECU to reduce engine torque etc via closing the throttle, modifying engine ignition or fuelling. It is believed that this data connections allows this control to take place. Differential serial data is transmitted via the ENG+ and ENG- pins. F60 15 NEO Slave Engine Speed Sensor Output This pin is used to supply a copy of the engine speed (NE) signal to the ABS, TRC and VSC ECU. Engine speed is a useful parameter for ABS, TRC and VSC control. This pin connects to the ABS, TRC and VSC ECU pin NEO. F60 16 +B Switched Battery Power Input This pin is used to supply switched battery power to the ECU. Used to supply power. This pin is connected to battery voltage when the Main EFI Relay is energized to supply power to the ECU. The Main EFI Relay is triggered by the engine ECU pin M-REL pin. F60 18 REC2 Hydraulic Fan Control Output This pin is used to control the speed of the hydraulic engine cooling fan. The speed of the hydraulic engine cooling fan is determined by the temperature of the engine coolant in the lower tank of the radiator. This pin is used together with the REC pin to power the solenoid that controls the flow of hydraulic fluid and hence the speed of the hydraulic engine cooling fan. The REC and REC2 pins are triggered by the engine ECU in a PWM fashion. F60 20 TRC- ABS & TRC & VSC ECU Serial Data Output It is believed that this pin is used to communicate data via serial from the ABS, TRC and VSC ECU to the engine ECU. It is believed that the ABS, TRC and VSC control systems can act to modify the engine control as required by requesting the engine ECU to reduce engine torque etc via closing the throttle, modifying engine ignition or fuelling. It is believed that this data connections allows this control to take place. Differential serial data is transmitted via the TRC+ and TRC- pins. 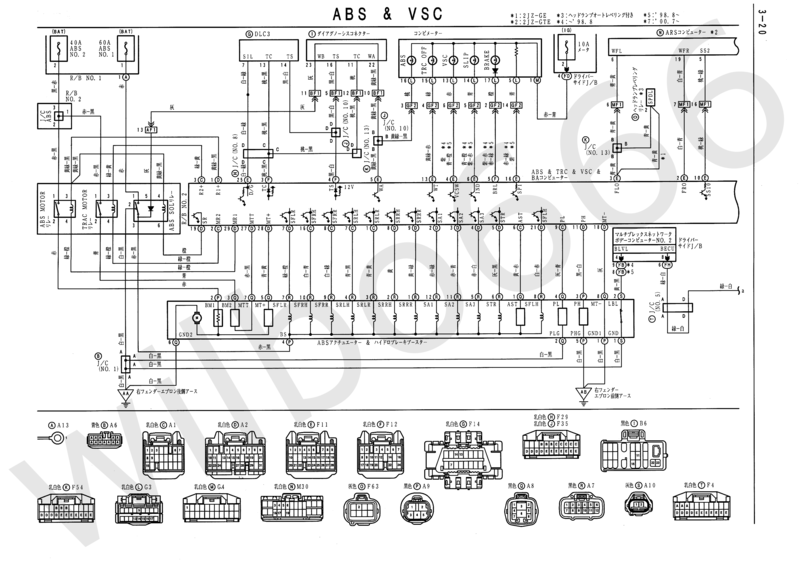 F60 21 ENG- ABS & TRC & VSC ECU Serial Data Input It is believed that this pin is used to communicate data via serial from the engine ECU to the ABS, TRC and VSC ECU. It is believed that the ABS, TRC and VSC control systems can act to modify the engine control as required by requesting the engine ECU to reduce engine torque etc via closing the throttle, modifying engine ignition or fuelling. It is believed that this data connections allows this control to take place. Differential serial data is transmitted via the ENG+ and ENG- pins. F60 22 EC PRE and PRE2 Switches Ground Input Ground. Used to supply a Ground path to allow current to flow. It is believed that a separate ground is used for the PRE and PRE2 switch inputs due to the location of the PRE and PRE2 switches. This pin connects to Ground or the battery negative. F84 9 EOM GND Input Ground. Used to supply a Ground path to allow current to flow. This pin connects to Ground or the battery negative. F84 10 KSW Key Inserted Input This pin is used to detect if the vehicle key has been inserted into the ignition barrel. As part of the engine immobilization system insertion of the key can be used to trigger the process to verify the key matches correctly. This pin is connected to ground when the key is inserted into the ignition barrel. The ECU pin is open circuit when the key s not inserted into the ignition barrel. F84 20 IMLD Immobilizer LED Output This pin is used to illuminate the immobilizer LED. The immobilizer LED is used to indicate the status of the vehicle immobilization system. This pin is connected to battery voltage to turn the immobilizer LED ON. F84 21 TXCT Key Amplifier Output This pin connects to the key amplifier. The exact function is unknown. Part of the vehicle immobilization system. The exact function of this pin is unknown. F84 22 RXCK Key Amplifier Input This pin connects to the key amplifier. The exact function is unknown. Part of the vehicle immobilization system. The exact function of this pin is unknown. F84 23 CODE Key Amplifier Input This pin connects to the key amplifier. The exact function is unknown. Part of the vehicle immobilization system. The exact function of this pin is unknown. This plug is located at the front, passenger side of the engine bay and mates with male connector 90980-11530. BF1 2 Engine ECU: E2 Ambient Temperature Sensor Ground Output The body loom side of this pin connects to the ambient temperature sensor thermistor mounted at the far front of the car. The engine loom side of this pin connects to the engine ECU pin E2 to provide a ground for the ambient temperature sensor. BF1 3 Engine Mounted Diagnostic Connector: AB SRS Airbag Power Input The body loom side of this pin connects to the SRS airbag control ECU AB pin. The engine loom side of this pin connects to the diagnostic connector mounted on the side of the engine. Note: Pre 2000-07 models only, later models do not have this pin wired. 4WS ECU: TS Test Enable Input The body loom side of this pin connects to a number of control module TS input pins. BF1 6 Engine ECU: R Reverse Gear Automatic Transmission Position Switch Indicator Output The body loom side of this pin needs to be connected to the engine ECU R input pin and the reverse lights. The engine loom side of this pin connects to automatic transmission shifter position switch mounted on the automatic transmission and outputs battery voltage when the automatic transmission shifter is in the R position. BF1 7 Alternator Battery Voltage Sense Input The body loom side of this pin needs to be connected to the battery via a 5A fuse. The engine loom side of this pin connects to the alternator S pin. BF1 8 Proportional Power Steering ECU: SOL+ Proportional Power Steering Solenoid Input The body loom side of this pin connects to the proportional power steering ECU SOL+ pin. The engine loom side of this pin connects to the proportional power steering solenoid located on the power steering pump. BF1 9 Proportional Power Steering ECU: SOL- Proportional Power Steering Solenoid Input The body loom side of this pin connects to the proportional power steering ECU SOL- pin. ABS & VSC ECU: WA ABS Input The body loom side of this pin connects to the ABS control ECU WA pin and also the ABS light mounted in the dash. The engine loom side of this pin connects to the diagnostic connector mounted on the side of the engine. Note that there is a shorting link inserted between terminals WA and WB of the diagnostic connector. ABS & VSC ECU: WB ABS Output The body loom side of this pin connects to the ABS relay. The engine loom side of this pin connects to the diagnostic connector mounted on the side of the engine. Note that there is a shorting link inserted between terminals WA and WB of the diagnostic connector from factory. 4WS ECU: TC Test Connector Input The body loom side of this pin connects to the TC pin on a number of control modules. This plug is located at the front, passenger side of the engine bay and mates with male connector 90980-11596. BF2 1 Engine ECU: ACMG Air Conditioning Magnetic Clutch Relay Trigger Signal Output The body loom side of this pin needs to be connected to the AC magnetic clutch relay coil negative. The engine loom side of this pin connects to the engine ECU ACMG pin. BF2 2 Engine ECU: P Park Gear Automatic Transmission Position Switch Indicator Output The body loom side of this pin needs to be connected to the engine ECU P input pin. The engine loom side of this pin connects to automatic transmission shifter position switch mounted on the automatic transmission and outputs battery voltage when the automatic transmission shifter is in the P position. BF2 6 Power to Coils and Igniter Input The body loom side of this pin needs to be connected to battery voltage via the ignition switch when the ignition is in the RUN and CRANK positions to switch battery voltage to the coils and igniter. The engine loom side of this pin connects to the coil and igniter power supply pins. BF2 7 Power to Fuel Injectors Input The body loom side of this pin needs to be connected to battery voltage via the ignition switch when the ignition is in the RUN and CRANK positions to switch battery voltage to the fuel injectors. The engine loom side of this pin connects to the fuel injector power supply pins. BF2 8 Starter Motor Relay Switched Power Input The body loom side of this pin needs to be connected to the starter motor relay switched power output which switches battery voltage to the starter motor to turn it on. The engine loom side of this pin connects to the starter motor. The starter motor is grounded via the engine block. 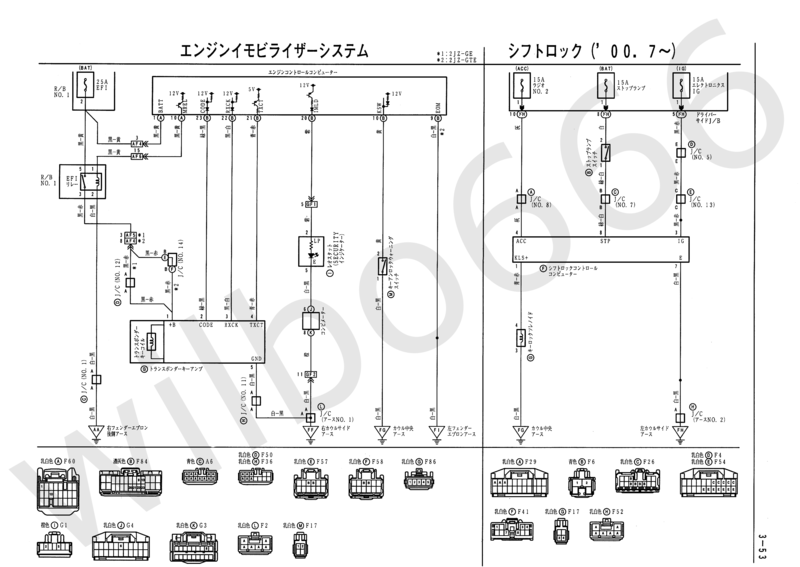 Refer to pins BF3-4 and BF3-5 for further information regarding the starter / starter relay circuit. BF2 9 Engine ECU: +B, +B2 Main EFI Relay Switched Power Input The body loom side of this pin needs to be connected to main EFI relay switched power output which switches battery voltage to the engine ECU, VSVs, etc. The main EFI relay is switched via the engine ECU M-REL output pin. The engine loom side of this pin connects to the engine ECU, VSVs, etc power supply pins. This plug is located at the front, passenger side of the engine bay and mates with male connector 90980-11709. Engine Mounted Diagnostic Connector: IG- Tachometer Output from Igniter Output The body loom side of this pin needs to be connected to the dash tachometer and other vehicle systems. The engine loom side of this pin connects to the engine ECU TACH pin which outputs a 0V to battery voltage signal that is related to engine RPM. BF3 3 Engine ECU: D Drive Gear Automatic Transmission Position Switch Indicator Output The body loom side of this pin needs to be connected to the engine ECU D input pin. The engine loom side of this pin connects to automatic transmission shifter position switch mounted on the automatic transmission and outputs battery voltage when the automatic transmission shifter is in the D position. BF3 4 Engine ECU: STA Starter Motor Relay Trigger Signal Output The body loom side of this pin needs to be connected to the starter motor relay coil to turn it on when the ignition switch is in CRANK position and the automatic transmission park / neutral switch is closed - that is the automatic transmission selector is in the park / neutral position. The engine loom side of this pin is connected to the automatic transmission park / neutral position switch and also the engine ECU STA pin. Refer to pin BF3-5 for further information. BF3 5 Starter Signal Input The body loom side of this pin needs to be connected to battery voltage when the ignition switch is in CRANK position. The engine loom side of this pin connects to one side of the automatic transmission park / neutral switch to provide power to the automatic transmission shifter position switch. Refer to pin BF3-4 for further information. BF3 7 Engine ECU: E1 Ground Output The body loom side of this pin connects to the ground for the cruise control switch assembly. The engine loom side of this pin connects to the engine ECU E1 pin which is Grounded at the intake manifold. BF3 9 Ignition Switched Power Input The body loom side of this pin needs to be connected to ignition switched power source that supplies battery voltage when the ignition is in the RUN and CRANK Positions. The engine loom side of this pin connects switched battery voltage to the alternator, automatic transmission position switch and the reverse lights.